Behaviors that are rewarded tend to re-occur. Reward and Promote Self-Control, never reward impulsivity. Students with ADHD tend to act impulsively, not thinking about the consequences first. One of the hallmarks of children with attention deficits is the tendency to act impulsively (acting before thinking through the ramifications of behavior). Behaviorally, this manifests itself in a lack of understanding of cause and effect. Research also suggests that these students can often verbalize the rules in place for behavior but have difficulty internalizing them and translating them into thoughtful behavior. Difficulties in delaying gratification also add to the impulsivity. Some clinicians believe that this behavioral disinhibition (poor regulation and inhibition of behavior), rather than their ability to pay attention, is the primary manifestation of attention deficits and is more likely to discriminate these children from others. By having students think “out loud” when they are problem solving, the teacher will gain insights into their reasoning style and the process will slow them down before they respond impulsively. This will provide information about how they “see the world” and enable the teacher to begin to restructure inaccurate perceptions. Train your student’s teachers and other adults how to do this to provide an on going technique in the classroom setting, where critical incidents often occur. Quite often, students will continue to have difficulty with certain types of interactions on a regular basis; difficulty in taking turns, over interpreting others’ remarks as hostile, personalizing others’ actions excessively, and misreading social cues. With the help of your student, his teacher, and his trusted peers, common problematic themes can be identified. Role play hypothetical interactions involving these behaviors, preferably with supportive peers, identifying and practicing positive alternative responses. Have your student practice these responses during the school day and have him and others give you feedback on their success. Identifying critical incidents that occur during the day will provide insights for program planning. The technique of “Stop Think Talk Do” is central to many cognitive behavioral interventions for students with attentional teaches the student how to “stop” before acting impulsively, “think” about the cause and effect relationships of his intended behavior, “say” or verbalize to themselves or others what they will do, and “do” the chosen behavior. Again, the purpose of the technique is to slow down response. Encourage thoughtful responding and decrease impulsivity by waiting 10 to 15 seconds to receive responses during whole group instruction. Keep the classroom behavior rules simple and clear. Have the class agree on what the rules should be. Define and review classroom rules each day. 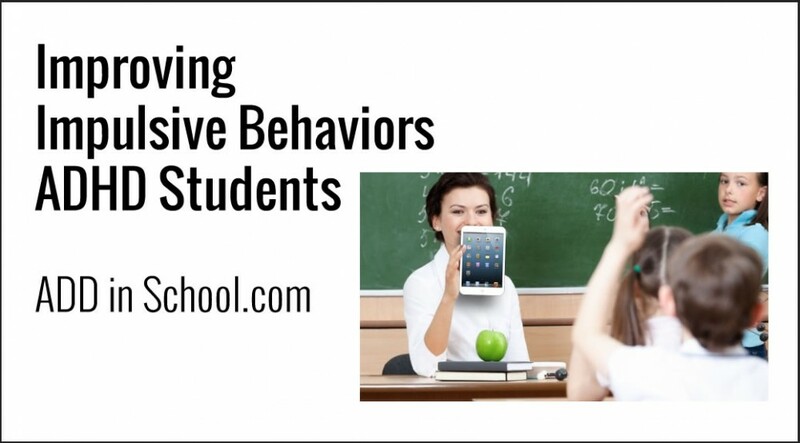 Implement a classroom behavior management system. Actively reinforce desired classroom behaviors. Use self monitoring and self reinforcement on task behavior during independent work time. Use a kitchen timer to indicate periods of intense independent word and reinforce the class for appropriate behavior during this period. Start with brief periods (5 10 minutes) and gradually increase the period as the class demonstrates success. When necessary, develop contracts with an individual student and her/his parents to reinforce a few specific behaviors. Set hourly, daily, weekly, or monthly goals depending on the reinforcement needs of the specific student. Provide frequent feedback on the student’s progress toward these goals. Provide a changing array of backup rewards or privileges so that students do not “burn out” on a particular system. For example, students can earn tickets for a daily or weekly raffle for the display of positive behavior. To improve out of the classroom behavior, allow the class to earn a reward based on he compliments they receive on their behavior from other teachers, lunchroom staff, playground aides and principals. Avoid giving the whole class negative consequences based on the ADHD child’s behavior. The ADHD child, as well as the whole class, can benefit from implementation of social skills curriculum for the entire class. Modeling and requiring the children to use a systematic method of talking through classroom conflicts and problems can be particularly valuable for the ADHD child to implement this, teachers are referred to the literature on cognitive behavioral approaches to developing the child’s self talk and problem solving. Praise specific behaviors. For example, “I like how you wrote down all your assignments correctly,” rather than “Good boy!” Use visual and auditory cues as behavioral reminders. For example, have two large jars at the front of the room, with one filled with marbles or some other object. When the class is behaving appropriately, move some marbles to the other jar and let the students know that when the empty jar is filled they can earn a reward. Frequently move about the room so that you can maximize you degree of proximity control. When appropriate, give students choices about several different activities that could choose to work on one at a time. With students who can be quite volatile and may initially refuse negative consequences (such as refusing to go to time out), set a kitchen timer for a brief period (1 2 minutes) after refusal has occurred. Explain to the child that the child can use the two minutes to decide if she/he will go to time out on her/his own or if more serious consequence must be imposed. Several experienced teachers insist this method has successfully reduced the extent to which they have had to physically enforce certain negative consequences with students and seems to de escalate the situation.